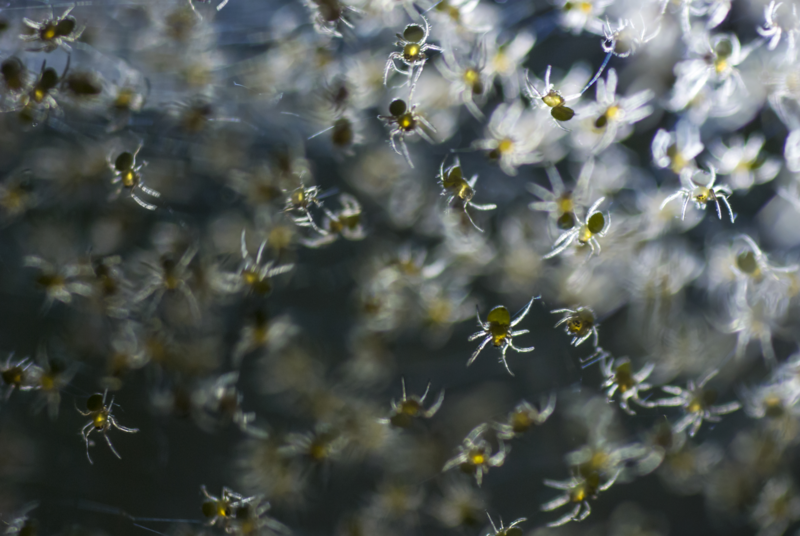 Worryingly described by entomologists and arachnologists as a “not uncommon” occurrence in certain parts of the globe, spider rain can see anywhere from a few thousand to several million spiders tumble from the sky in a given area, seemingly out of nowhere. So what causes it? This is thanks to a rather interesting behaviour exhibited by spiders known as ballooning, which essentially involves an individual spider climbing to a high point and then firing strands of silk into the air, with the result being the spider being carried away by the wind, sometimes for many hundreds of miles. Arachnologists are quick to point out that countless spiders are probably flying around over head at any particular time and that they usually land without much fanfare and go about their way. 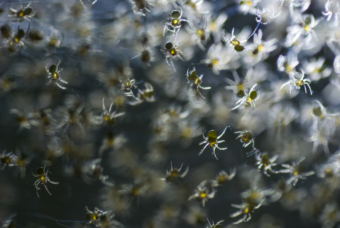 Sometimes, though, many thousands or millions of spiders will decide to balloon at the exact same time, either because they’re a single colony or because weather conditions force them to. In regards to the latter, on rare occasions certain weather patterns can see the millions of spiders floating through the air at any given time being thrown to Earth simultaneously at the same location. Other known causes of spider rain are floods and wildfires, which can prompt spiders to flee en masse to escape what would otherwise be their own demise, concerningly illustrating that the age old “kill it with fire” way of getting rid of spiders isn’t fool-proof. As an example of the former flood trigger phenomenon, in Pakistan following devastating floods throughout the country in 2010, millions of spiders noped out of there in a hurry via mass ballooning. While you’d expect the people of Pakistan to be unhappy about having to deal with both millions of spiders raining from the sky and floods, the spiders were seen as a good thing by most citizens because they ate all the mosquitoes. On that note, in addition to ensuring the skies remain free of disease carrying insects, wandering clouds of spiders also provide ample food for birds and other creatures- a fact that combined with spiders often being amongst the first creatures to return to land devastated by flood and fire (via ballooning and landing back in the area), means that spider rain is generally seen as being an overall beneficial thing for nature via allowing these staples of the food chain to quickly and widely disperse themselves. Luckily for arachnophobes, mass ballooning is a behaviour near exclusively observed in smaller species of spider or ones that were born very recently, as larger spiders are simply too heavy to be carried along by typical winds. As a result, if you’re currently imagining endless waves of tarantulas raining from the sky, you can rest assured that if you ever witness spider rain firsthand, at least you won’t be dealing with big spiders, just the little ones that can crawl around on you without you even noticing they’re there… This is also significant because most small spiders don’t posses the ability to penetrate human skin with their bites, even if they are otherwise highly venomous. I may have to unsubscribe, as I get frustrated with the poor quality of writing in some TIFO articles. For example, in today’s “The Terrifying Phenomenon of Spider Rain”, the author invents a word (concerningly) and uses a colloquialism which is unknown to me (noped out). The writer may think himself clever, but the result is that the flow of an otherwise interesting story is interrupted while the reader pauses to interpret it. Also, I have sometimes noticed extensive use of parenthesis, including entire paragraphs. Use them sparingly, and learn to use commas! This is English Composition 101. Rant mode off. Thanks for “listening”. Perhaps it’s time to pick up a dictionary, because “concerningly” has been a word since the 17th Century. Speaking of the 17th Century, language has a funny way of evolving, which is what makes it so rich and amusing to those who care to listen! “Noped out” is a common colloquialism in trending times meaning “removing oneself from the area/situation as quickly as possibly”. Interestingly enough, I don’t see an “entire paragraph” of parenthesis. Maybe it’s time for an eye exam, ey old boy? It ain’t done bother me none! I just found this site and I thought the writing was splentacular. Why is this terrifying? It’s fascinating! If it weren’t for spiders, we’d have a lot more insect pests. I have seen tarantulas, lots of tarantulas, crossing roads and moving uphill when weather or flooding is in the forecast. I agree, language does evolve. Just so we all are clear – Rick B. has unsubscribed.